Natural treasures are abundant this time of year! We love to craft, play, and explore with acorns. I turned our collection into DIY letter manipulatives. 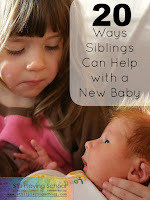 Kids will love to help you collect acorns! If you are nervous about bringing them inside for play due to bugs, you can soak the acorns in a bucket of water outside overnight. Discard any of the acorns that float as they have air inside and are likely homes to insect grubs! All other acorns should be safe for play but if you are are still unsure this can be an outside activity! I used Sharpies to write uppercase letters on one side with lowercase on the other. 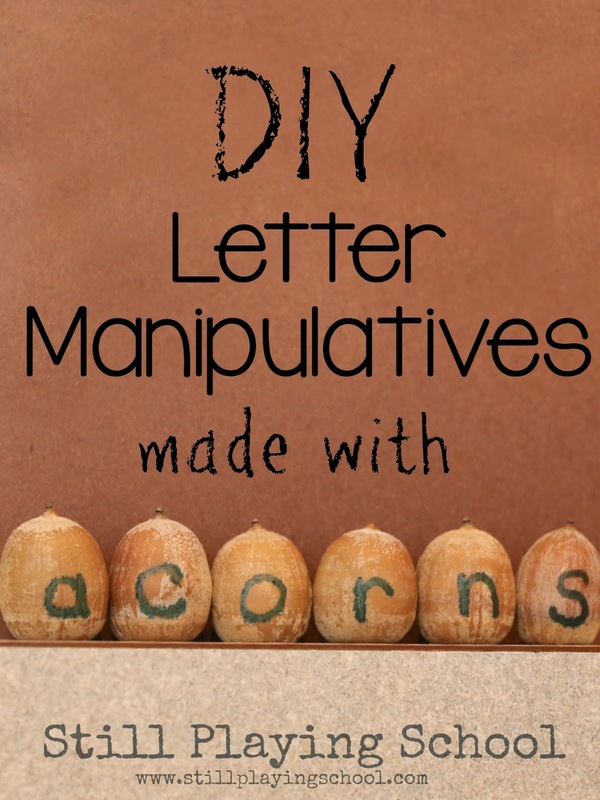 This makes the manipulatives self-checking as our kids can flip the acorns to correct letter identification since our daughter has some lowercase b ,d, p, q confusion! We've practiced putting the letters in order in our egg tray. (We got ours from The Dollar Store but here is a similar option.). Our daughter E was very motivated by this task! I purposely chose acorns that could stand up without wobbling over. We spelled the names of people (and cows) that we are thankful for to use in a gratitude project. This is a great Thanksgiving gift that can be emailed or printed out and framed! 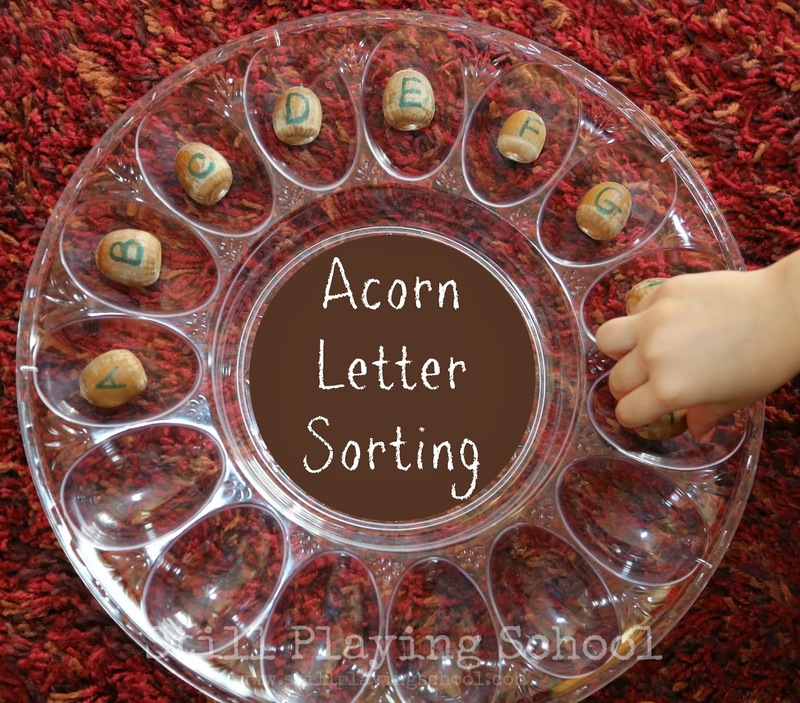 Alternate activities would be using the acorns to work on word families or putting them in our bird seed sensory bin! 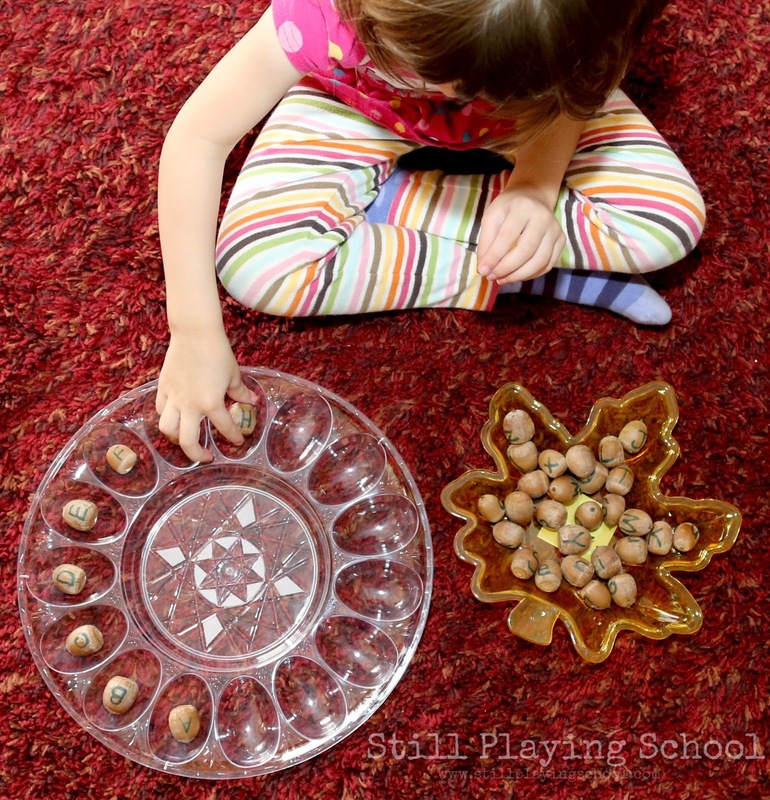 Scooping the acorns with a spoon or using tongs to pick them up will work those fine motor muscles. Do you have acorns where you live? 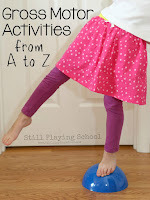 I'm curious about how many states have these fun fall materials available for free! Um duh. I just found the pin place on your page. See how technologically inept I am? ?